Nearly six months ago, in one of the first pieces I posted on this site, I wrote an essay discussing the film Super 8 and my impression of its marketing. Specifically, I felt the film’s advertising campaign, built primarily around building intrigue for the film’s mysterious creature, and secondarily on nostalgia for old Steven Spielberg movies, seemed to me an ineffectual approach to marketing a poorly defined film, and that had dulled my already limited desire to see the movie. Six months later, I stand by my assessment of that approach, and if anything, I’m even more critical of it now, especially given how much I appreciated Super 8 once I finally got around to seeing it. That assessment may seem ironic, given that this film is precisely what it’s advertised to be: a science fiction mystery that pays direct homage to the archetypal Spielberg movie. The archetypal Spielberg movie, for the uninitiated, is one that would have been made by Spielberg, in the capacity of director or producer, during the 1970s and 80s. The general story would involve placing middle class characters, sometimes younger preteen characters, in a situation where they’re forced to reckon with some unnatural entity or occurrence that has upset the balance in their community. Films like Close Encounters of the Third Kind, Poltergeist, The Goonies, Jaws, and E.T. were all examples of the “Spielberg movie.” In Spielberg movies, the unnatural force, even if it appeared initially monstrous, would either be proved innocuous or otherwise be overcome by the ingenuity of the human characters. Those characters, too, were very contemporary archetypes of the then modern suburban family, and were commonly affected by such things as divorce, marital discord, financial difficulties, absentee parenting, or general social isolation. When younger characters were the focal point of the story, Spielberg presented them as emotionally complex, sophisticated, independently minded, and generally capable of solving their own problems; often in sharp contrast to the adults they had to answer to. E.T. 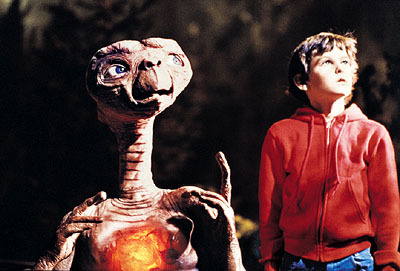 The Extra-Terrestrial is probably the defining example of the archetypal Spielberg movie. Unnatural entity? Check. Small town? Check. Single, divorced parent? Check. Kids who outsmart trained military operatives? Check. Made gobs and gobs of money? Double check. 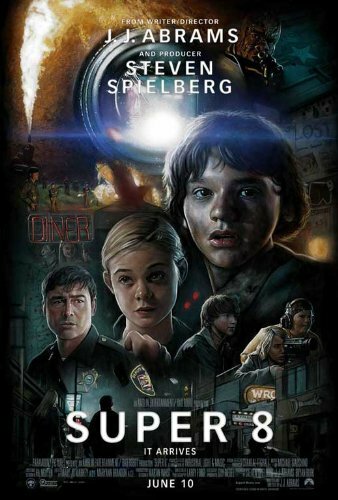 As a conscious throwback to classic Spielberg movies, Super 8 is also set in a small town, and its heroes are a group of young tweens, some of whom come from homes that, if not necessarily broken, are in dire need of repair. Set in 1979, which of course was during Spielberg’s original cycle of filmmaking, the film story tells of twelve-year-old Joe Lamb (Joel Courtney), a horror and fantasy movie fan who dreams of some day becoming a make-up designer for the movies, and who only recently experienced real life horror when his an industrial accident killed his mother. Joe lives with his grief-stricken father, a local sheriff’s deputy (Kyle Chandler, paying homage to Roy Scheider’s police chief from Jaws), and the relationship between the two has become painfully tense. The biggest thing in Joe’s life is helping his friend Charles (Riley Griffiths) shoot a zombie movie (on Super 8 film, naturally). Charles has convinced Alice Dainard (Elle Fanning), one of the prettiest girls in school, to star in their movie, which causes consternation with Joe; Alice’s alcoholic father (Ron Eldard) was his mother’s co-worker, and Joe’s father blames the man for his wife’s death. The young filmmakers of Super 8. Charles (Riley Griffiths) and Joe (Joel Courtney) reviewing their Super 8 film. Though written and directed by the prolific J.J. Abrams, Super 8 feels, both thematically and aesthetically, unmistakably Spielberg (who is one of the film’s credited producers). Even its heroes are analogous acolytes of Spielberg himself – self-trained, do-it-yourself filmmakers inspired to create by their love of movie fantasies. However, to his credit, Abrams seems to be trying to do more than just pay homage to his cinematic mentor, he’s making a commentary by placing the themes of his film in a more modern context. What concerned me about Super 8 before I saw it was my belief that we really didn’t need the type of nostalgia Spielberg’s films invoked in this day and age. As I said in my earlier piece, “Spielberg’s work, with obvious exceptions… just feels so archaic these days…like relics of a bygone era we really just can’t go back to, nor should we want to. They evoke a more naïve period in history, at least for me.” My unsaid implication was that after the many traumas that have effected the American psyche in the new millennium, such as terrorist attacks, natural disasters, economic catastrophes, and deepening political divides, the fantastical narratives, trite suburban angst, and perfunctory happy endings in Spielberg’s films seemed entirely irrelevant in the modern era. 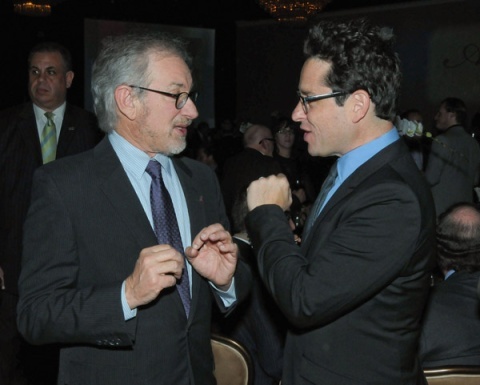 Steven Spielberg, producer and artistic inspiration for Super 8, and writer/director JJ Abrams. After seeing the movie, it seems to me that Abrams may have had the same concerns I did. This is fortunate, because the reason Super 8 proves effective is because, for all its nostalgic flourishes, it is, at its core, very contemporary. The film is essentially about characters facing their trauma and addressing their grief while attempting to overcome an extraordinary situation. Abrams essentially uses the methodology and iconography of Spielberg to address modern themes just as Spielberg used them to address the themes that seemed relevant in his own time. Of course, if I’m making this sound in any way pretentious or depressing, then the error is mine; Super 8 is a thoroughly fun, exciting, witty, popcorn movie with a heart. And while there are some deep themes at work here, the film is in no way a downer, and it boasts one of the best end credit sequences this side of a Pixar film. The characters are well written and well performed across the board, and Abrams actually does something Spielberg rarely did, he foregrounds them in the film ahead of the monster that ostensibly drives the film’s story. Spoiler alert: this is not the monster from Super 8. 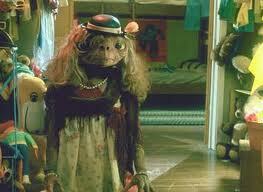 A friend of mine on Facebook commented to me that his impression of Super 8 was that it seemed to him like “E.T. for a new generation.” He was right, and on more than one level: while Super 8 might be something of a postmodern reimagining by Abrams of Spielberg’s E.T. The Extra-Terrestrial, the monster in the movie, in and of itself, is also like the character E. T. reconfigured for our era. It’s E.T. if he were never able to call home, or had his call refused, or if he had perhaps become the prisoner of the government agents who had tried to capture him. And because of this, he’s angry, embittered, violent, cruel, and above all, desperate for help. In the end, the fact that the monster is so much a reflection of our own national psyche makes the ultimate message of Super 8 and its nostalgic approach all the more cathartic. Often, the pains of our time seem somehow privileged to our moment and our moment alone, but the truth is they’re really not. In the end, whether the time in question is 1979, 2001, 2005, 2008, or 2011, living is, and always will be, hard – but somehow, we still find ways to face, and overcome, our monsters. Posted on November 25, 2011, in The Antiscribe Appraisals (Reviews) and tagged abrams, monster, spielberg, super 8. Bookmark the permalink. Leave a comment.